This article first appeared in the March 9 2017 edition of the Ottawa Citizen. So how about it? Wherever you go, how about seeking that fresh perspective? Maybe it’ll be Cuba, Mexico, the Dominican Republic. Or Hawaii: the Big Island, for example, where this traveller went last year. In the course of relaxing, the place might also help you see things—indigenous/ settler things—with fresh eyes. Take surfing, for example. The Kona Coast surfers look like seals at first, bobbing out past where ordinary mortals venture. They let most waves pass through them; then miraculously, they’re up, like heroes of old, sliding over and inside the chosen white-capped wave as it breaks, then returning for the next one. 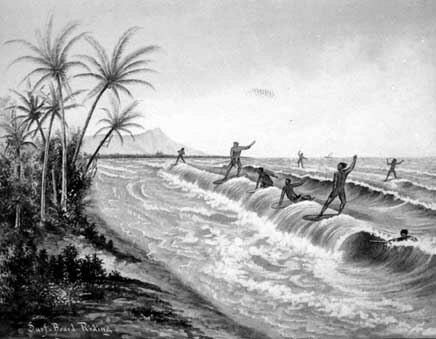 It turns out that surfing was a Native Hawaiian invention. Captain Cook’s first lieutenant sketched Hawaiians surfing off that same Kona coast in 1779. The surfers blessed their boards with chants, asking the responsible gods to give them courage. Watching surfers now, you realize that the ancient Hawaiians were right: there is something religious about it– for both surfer and spectator. But maybe snorkelling’s your thing. The best snorkeling on the Big Island may be at Captain Cook, in Kealakekua Bay, where the legendary English explorer died in 1779. Cook had named the isolated Polynesian islands the Sandwich Islands after he “discovered” them the year before. But Kealakekua Bay was sacred to the people who lived there. By Cook’s third visit, he was no longer welcome. The Hawaiians hurled rocks at his ship. One chief was shot and Cook was clubbed to death —two early, vivid casualties in the history of Indigenous-European relations on the islands. Jodi Bruhn is the director of Stratéjuste Canada. She spent two weeks on a Big Island beach last February.